Disruptive technologies and innovative network architectures dominated the SATCOM industry during 2018 and dramatically changed the methods by which SATCOM businesses plan and operate. In the well-established GEO Satellite world, discussions today are more about 5G, IoT, and LEO/MEO constellations than about High Throughput Satellites (HTS) or the launching of another GEO satellite. As a company that thrives on technological challenges, Advantech Wireless Technologies (“Advantech”) was part of this massive industry shift. As history shows, companies that have the DNA to adapt and thrive in adversity are those that will lead the innovation and industry evolution in the future. 2018 started on a highly positive note for Advantech. In January, Baylin Technologies purchased the company. The Baylin Group includes Galtronics, a 40 year veteran in the wireless communications business specializing in advanced antenna design and a pioneer in 5G MIMO technology. Advantech itself brings 30 years of expertise in active RF MW design in cellular, terrestrial point to point microwave links as well as SATCOM and RADAR technologies. The synergies between the two companies are dynamic and strategically aligned. Advantech has a successful history of listening to the firm’s customers and collaborating with them to successfully solve their challenges. Due to increasingly sophisticated customer demands, technologies in the SATCOM industry today can quickly become outdated. Only a few years ago a teleport operator or service provider could invest in a hardware solution and confidently know that it would safely last for 10 years or more. Today, this is not necessarily the reality. Fifteen years ago, data rate demand would range from a few kbps to 1 Mbps. Due to the introduction of HD video services, a single HD video channel — when compressed — would requires as much as 7 Mbps. This demand required LTE cellular growth. Now, ultra HD 4K video requires an additional four times more bandwidth. Required data rates today range up to 30 Mbps. This demand brings challenges to older teleports, SNG trucks,and terrestrial wired IP networks. Looking forward, 5G and IoT will require as much as 10 Gbps of aggregated data rates as well as low delay processing time for real time applications, such as autonomous vehicles. These technological advancements demand leading-edge solutions from service providers and satellite operators. • Large Teleports that required very high power SSPAs to efficiently support high bandwidth demand and high modulation. While hardly imaginable five years ago, installing SSPA technology with power levels of 6kW in large teleports has become the norm. 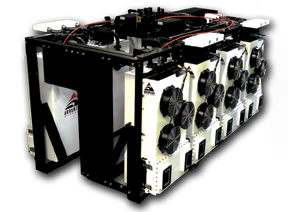 These modular systems with built in redundancy provide 100 percent availability for critical video broadcasting events while drastically reducing OPEX at the teleport. The initial investment in Advantech’s SapphireBlu™ GaN based technology is typically recovered in less than two years of electrical energy savings and overall operating costs because the system is capable of replacing tens of klystrons or traveling wave tubes (TWTs). The most critical advantage of the SapphireBlu GaN technology is the ability to support Ultra HD 4K 8K and higher order modulation rates such as 256 APSK. In 2014, Advantech Wireless designed and built two teleports that were used for the first time to transmit major sporting events in Ultra HD. This was a milestone and an international achievement largely recognized in the industry. The ability to design and manufacture SSPA technology that reduces OPEX and is future proofed against additional bandwidth increase demands puts Advantech Wireless in a commanding position. The company is currently actively involved globally in analyzing existing teleport architectures and providing consulting services for technology upgrades. All teleports today struggle with high operating costs and reduced revenue due to customer migration to alternative technologies. Most of these teleports are using inefficient and often outdated RF technology. As a major sign of market acceptance, in September of 2018, one of the largest worldwide video broadcasting companies installed a 3kW GaN based Ku-band system, capable of up linking more than 1 Gbps of Ultra HD video content. The recognition of the company’s state-of-the-art technology solutions and R&D innovations led several international customers to grant Advantech single source supplier status for all their RF needs. Successful organizations realize the benefit of reducing and consolidating their supplier chain while aligning their R&D road maps. Advantech achieved an additional milestone in the summer of 2018. A 256 APSK link was achieved with just one 4.5 meter C-band antenna, equipped with only a 400W C-band SapphireBlu GaN technology. A remarkable efficiency of 8 bits per Hz was achieved with a much smaller EIRP (Effective Isotropic Radiated Power), which allowed the end user to employ only a portion only of the transponder, without taking the entire capacity from adjacent customers. With 5G and IoT coming online, now data rates in excess of 1 Gbps will be economically feasible for a SATCOM Uplink. This solution was desperately needed by the teleport operators in order to remain relevant in the years to come. In July of 2018, Alga Microwave (“Alga”), an RF and MW design and manufacturing company, also joined the Baylin Group. Alga Microwave brings unique expertise in SATCOM as well as the wireless and cellular market. Some of the world’s largest cellular network manufacturers use Alga Microwave technology in their base stations, strategically positioned around advanced Microwave filters, combiners, and diplexers. In December of 2018, Advantech will relocate with Alga to a new, state-of-the-art design and manufacturing facility to efficiently deliver one of the most ambitious R&D roadmaps in the industry. The future prospects for Advantech and the SATCOM Industry are extremely exciting. 2018 was a noteworthy year for ATLAS Space Operations™; having completed a Series-A round of investments, the company more than doubled in size to meet the demand for the firm’s services — 2019 is projected to be an even bigger year for the company. In 2018, ATLAS grew their Freedom™ Network of ground stations, bringing U.S. antenna locations in California, New Mexico, and Washington online as well as locations overseas in Ghana, Finland and New Zealand. Most significant of these locations is the antenna array located in Albuquerque, New Mexico — LINKS™, the world’s first commercially available, mobile, and rapidly deployable Electronically Steered Array (ESA). Currently, ATLAS is developing antennas for locations in Tahiti, Guam, Japan, and in Chile, as well as adding a ground station in Traverse City, Michigan — home to ATLAS’ corporate headquarters. 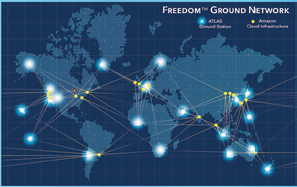 The fully completed Freedom Ground Network of antenna will consist of no-less-than 30 ground stations, all strategically dispersed across the globe. The company will provide connectivity for a broad range of missions that include launch support, communications with spacecraft in equatorial or polar orbit, as well as spacecraft in deep space. The other key-piece of game-changing technology for ATLAS is Freedom, ATLAS’ cloud-based software platform that’s aptly named because the offering breaks the antiquated norms of legacy software solutions. Freedom does much more than provide clients full telemetry, tracking, command, and control capabilities; the software’s advanced scheduling algorithm does all of the work for the user, making the entire process easier and faster as well as more cost-effective. Gone are the days of needing a separate satellite modem for every antenna because Freedom requires only a single point of VPN access that integrates into the Freedom Network of global ground stations, making it far superior with ensuring data security. However, the Freedom Platform and Network are only the framework of what the company set out to accomplish just three short years ago. With optical communications soon to be a necessity throughout the industry, ATLAS’ engineers are already working on a game-changing optical communications solution. Starting in 2019, ATLAS will install 30 additional ground nodes for the Laser Light Communications HALO™ Network as part of the joint venture between ATLAS, Xenesis and Laser Light Communications — the Empower Space Alliance™. More information about ATLAS Space Operations, Inc. is available at www.atlasground.com. 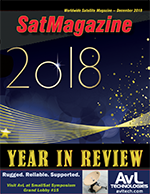 2018 has been an adventure for the satellite communications industry. Unexpected mergers and acquisitions, innovative new products and services, and new growth markets – from the perspective of someone who watches the market closely, several happenings in 2018 caught us by surprise, but in a good way. A few of Avl Technologies’ high profile customers experienced dramatic transitions during 2018, including reorganizations and mergers. Though this is not uncommon with satellite businesses, this was not something the company expected key customers to experience this year. Like it or not, consolidation and outsider investment will likely begin to happen more often as our industry innovates and grows and as companies from other industries find ways to enter satellite markets. We also did not predict the growth at AvL that was achieved during 2018. Though the company annually forecasts revenues and units sold to better predict manufacturing volume and staffing needs, we dramatically under forecasted. Yes, that is a good problem to have — AvL grew the Operations team by 25 staff members to maintain production schedules and the firm increased the Engineering team with several new additions in RF, product development and software engineering. Demand for recently launched products was strong and growth was in military orders as well as for established products — growth also continued in the demand for customized products. In 2016, AvL opened a new building, which was developed to be used as a technology incubator, a regional office for a key customer and as expansion space for the company. As AvL has continued to grow at a breakneck pace, the company has gradually started taking over this 60,000 square foot facility. In 2018, AvL’s electronics assembly, large reflector manufacturing, and large antenna assembly moved into the new building and the teams working on these products appreciate the high ceilings, natural light and state-of-the-art power systems. 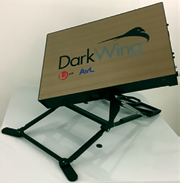 AvL launched the development effort for several new products during 2018, with the highlights being DarkWing™ and a 2.0 meter, ultra lightweight antenna. The company was also successful in transitioning a number of customers and legacy AvL antenna programs to a new auto-acquisition controller based on the firm’s powerful AAQ platform. DarkWing is AvL’s foray into flat panel satellite communications terminals. In collaboration with L3 GCS, the new DarkWing terminal will be designed to meet customer objectives for a lightweight, small, rugged and portable system that provides high-speed data communications for Internet, VPN connectivity and video transmission. The Ka-band terminal will offer global coverage, is small enough to fit in a backpack and, in most cases, can be mission-ready in minutes. It’s intended to be easy to operate, high performing, rugged and robust — and will be about the size of a laptop. AvL anticipates this product to be a key resource for many customers. AvL’s new 2.0 meter antenna will feature a segmented axi-symmetric carbon fiber reflector and a “space frame” base and positioner, making it ultra-lightweight. The easy-to-point manual operation antenna will feature an RF package with a 55W Ku-band BUC located behind the hub, which makes it highly configurable. The antenna can be assembled and on-network in less than 25 minutes and it packs into two checkable transit cases with each weighing 90 lbs. The AvL 2.0 meter ultra-lightweight flyaway antenna will be the most compact 2.0 meter antenna on the market and offers performance specifications comparable to competing 2.4 meter lightweight antennas with small pack-up. The new AvL AAQ controller platform has gained rapid acceptance in the industry and is now the controller of choice for many commercial and military antennas produced by AvL. The controller comes equipped with a web-based plug-and-play graphical user interface (GUI). The GUI can be expanded to provide terminal monitor and control (M&C) capability for various modems as well as an array of commercially available RF components. The latest version of software can support highly-inclined GEO satellite tracking and also uses a powerful new, standard, on-board AvL Receiver as well as a number of standard beacon tracking receivers. AvL customer SES continued to see robust orders for its O3b network transportable terminals featuring AvL antennas. Most of this demand was from the U.S. military for 85 cm., 1.2 meter and 2.4 meter MEO tracking antennas. These transportable, rapidly-deployable, tactical terminals feature a geared drive for continuous operation. The antennas operate in same size tandem pairs with make-before-break communications, are easily transportable in durable transit cases and can be set-up and on-the-air within two hours. AvL also introduced a new Family of Integrated Terminals, or FIT, two years ago and that was the company’s entrance into customer-requested product integration and axi-symmetric antennas. 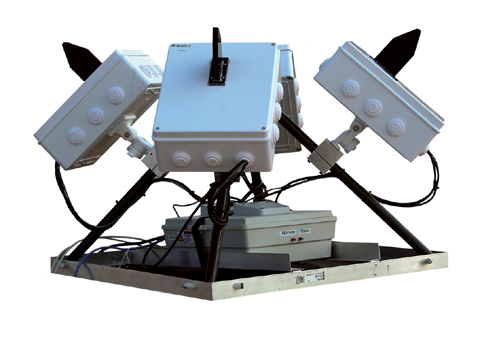 Through 2018, demand for these user-configurable antennas soared for both commercial and government customers and we added additional features and capabilities in response to customer requests. The ultra-compact, ultra-lightweight, ultra-high performance FIT terminals offer aperture sizes of 0.75 meters, 0.98 meters and 1.35 meters and are available with standard manual or upgraded motorized operation. The FITs are designed to accommodate current and future modem, RF and satellite frequency options, and pack into two IATA checkable cases. In 2019, AvL will celebrate its 25th anniversary. The company has grown dramatically since its humble beginnings in Jim Oliver’s garage in 1994 and the company is now 230 employees strong. AvL Technologies has shipped nearly 30,000 antennas to customers across the globe and the company is proud to be the antenna provider of choice for military, government/civil services, SNG, Oil & Gas and other markets. In 25 years’ time, AvL has transformed from a positioner company to an antenna innovator and trusted satellite communications collaborator for key customers. Though AvL is proud to celebrate 25 years of business, the focus remains on the future. 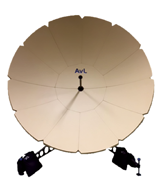 AvL’s mission is to be the global leader in transportable satellite antenna design, production, delivery and support. The company’s world-class engineering, manufacturing and customer service teams ensure the firm’s antennas provide superior durability, dependability and performance. Lives and livelihoods depend on the quality and reliability of AvL’s transportable satellite communications equipment, and the company will continue to design, manufacture and support the best products in the industry. Krystal Dredge is the Director of Marketing for AvL Technologies. Krystal has 15+ years of product marketing experience in satellite and wireless communications and, most recently, worked at Honeywell and EMS Defense & Space Systems prior to joining AvL in 2012. From military leaders conducting operations across the globe to commuters streaming music on their way to work, the need for data and a reliable connection is ubiquitous. The problem is that current communications architecture, both satellite communications and ground, will not be able to support the speed, security and capacity needs of tomorrow. How those demands are met within the constraints of scarce radio frequency (RF) spectrum means bringing transformational communications technologies to market — and fast. Ball Aerospace is developing two key technologies that are transforming communication architectures: optical communications terminals and inter-satellite links, and phased array antennas for SATCOM, in-flight connectivity and 5G. Free-space optical communication systems provide an innovative complement to traditional RF solutions, bringing the Internet speeds of terrestrial fiber optics to space. Using laser technology, optical communication systems offer a much narrower and more focused beam than traditional RF links, resulting in higher data rates, more capacity, greater security and smaller, lighter and more affordable terminals. Satellite operators are looking to large LEO constellations and high throughput geosynchronous satellites to meet communications demands. Both systems require a new generation of high-capacity, high-performance data links. Free space optical communication links are a key enabling technology for these constellations. This year, Ball Aerospace announced a collaboration with Honeywell to develop a line of affordable, high-performance optical communication terminals for the commercial market. Boasting a combined 60 years of experience in optical communications, Ball and Honeywell will work together to establish volume production of optical terminals for high-speed communications from ground to space, spacecraft to spacecraft and spacecraft to aircraft. Together, Ball and Honeywell will optimize volume production, enhancing technical designs for low-cost repeatability and leveraging a proven, robust supply chain. The team’s proven capabilities in developing and manufacturing precision space-based optical systems will ensure that cost, volume and technical requirements of tomorrow’s LEO and GEO communications satellites are met. For customers who need data at the speed of light, optical communications technologies deliver. Ball’s partnership with Honeywell is enabling this innovative technology area to expand into the commercial marketplace. Another encouraging technology trend over the past year has been the development and recognition of the potential of commercial phased array antennas. Phased arrays deliver the critical ‘last mile’ connection, the gap between the data source and the end user. Wireless last mile solutions enable global network infrastructures and a whole new class of mobility applications. Ball Aerospace has five decades of experience developing phased array antennas for the U.S. military, enabling mission-critical communications. Now, Ball is leveraging that expertise to transition phased array technology to commercial communications markets, including SATCOM and in-flight connectivity. The benefits of phased arrays are numerous and exhibit why this technology area, though not new, has exciting commercial applications. Ball phased arrays are electronically steerable, with no moving parts, meaning customers enjoy higher reliability and lower maintenance costs. The fast, agile and accurate steering of electronically steered phased arrays enables quick and seamless tracking between satellites — key for today’s in-flight connectivity and tomorrow’s large LEO constellations. The low profile of phased arrays reduces drag on mobile platforms, which is most notable on aeronautical platforms, reducing overall operating costs. Electronically scanned phased arrays provide a significant size and weight advantage over mechanically steered antennas. Much like many electronic devices today, these arrays are ‘smart,’ configured by software and aligned automatically, a major step up from parabolic dish antennas that require manual calibration and alignment. Ball is actively developing and selling modular, scalable antennas in the X-, Ku-, and Ka-band spectrums. Phased array technology is enabling the future of 5G wireless, the next generation of wireless technology for the smartphone and smart device market. The 5G architectures of the future will use millimeter wave radio frequencies. Ball has a wealth of experience manufacturing phased arrays that transmit and receive data in millimeter wave radio frequencies, delivering the speed and data throughput of fiber optics without the price — a must in the 5G marketplace. To demonstrate the capabilities of Ball’s commercial 5G phased arrays, Ball is working with Anokiwave and recently enabled the world’s first 5G commercially available 256-elemend phased array at 28GHz and 26GHz. The San Diego-based Anokiwave is a cutting-edge provider of highly-integrated circuit solutions that enable emerging mm-Wave markets and active antenna-based solutions. While commercial phased array technologies are promising, their commercial viability depends on the ability to drive down costs by manufacturing at scale. 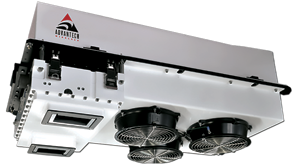 Ball has already delivered phased array systems with all the key components to government markets. In 2018, our focus remained ramping production into high gear with designs that can be manufactured in high volumes — a key solution for LEO communications constellations. For Ball Aerospace and the company’s transformational communications technologies, 2018 was a banner year. What’s next in 2019? More key tests to demonstrate the potential of the firm’s technology are on the horizon and Ball Aerospace will continue to leverage industry partnerships to deliver the best products for our customers. Cost continues to be a limiting factor in the viability of commercial communications constellations. Transforming an industry means manufacturing for scale. That’s where Ball is translating our high volume commercial packaging heritage to quickly and efficiently deliver ground and space products directly to the customer for immediate use. In 2019, the company will continue our work to scale manufacturing for commercial needs. In today’s world, a company’s success is directly related to its ability to connect with the people, technologies and markets that it depends on. As the need for data grows and the number of smart devices increases, customers staying connected depends on innovative adaptations for proven technologies like optical communications and phased arrays. Ball is transforming the communications architecture, delivering reliable, high-speed, high-bandwidth connectivity — between satellites and to and from space. The company’s innovative, high-bandwidth inter-satellite links and Earth-to-space links meet customer needs for data at the speed of light and connect the world faster and more securely. With low-cost phased array SATCOM antennas, innovative 5G Rapid Prototype Phased Arrays and advanced optical communications terminals, Ball Aerospace is helping the world meet today’s data demand. Brad Tousley is responsible for the company’s strategic technology roadmap and investing in innovative technologies and capital that is aligned with the firm’s customer needs and growth strategies. He brings more than 25 years of experience that spans government agencies, the private sector and the U.S. military. Prior to joining Ball, Brad led the Tactical Technology Office (TTO) at DARPA and was responsible for high-payoff/high-risk, efforts in space, air, maritime and ground systems, focused on capabilities for national security.